You have purchased one of the smartest and smallest devices with a unique kid walkie talkie. The lightweight and compact kid walkie talkie style device can be operated conveniently .Its ideal to stay connected with family or friends in parks, shopping malls, sporting events, concerts-virtually any indoor or outdoor activities. ▶ Upgraded Version of the BF-888S. Solid texture comes with a slim body, crystal clear voice speakers, enhanced signal transmission, long-distance communication and ultra-long battery life. ▶ USB 5V Desktop Charger which leads to more convenient charging way-with power bank, car charger adapter, or just connect to your laptop's USB port. 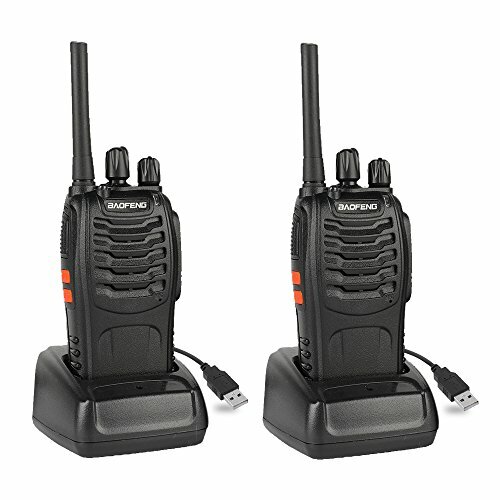 ▶ Various Occasions Using: BF-88A play an important role in REAL-TIME talking for Security Guard, Logistics Distribution, Supermarket, Construction Area, Hotel, most helpful for Field Survival and Outdoor Activities. ▶ Programming Software Download: https://bf-88a88e.s3.amazonaws.com/Programming%20Software%20%26%20Chirp%20BF-88A%20%26%2088E.zip ▶ Radioddity's products enjoys 1-YEAR warranty and 60 days no-reason return after-sales service.